ATLANTA— As this offseason continues to play out, I keep hearing rumors that the Braves are considering packaging Yunel Escobar in a trade deal for one starting pitcher or another. For a while, the rumor went that the Braves would trade off Escobar and then turn around and sign Rafael Furcal. While the chances that the Braves will be able to sign Furcal seem increasingly unlikely, there are still rumors circulating that Escobar could be sold for the right price. I think that the Braves would be fools to give up Escobar in a trade deal. Escobar hit a solid .288 last season, with a highly respectable .366 OBP, and a great strike-out to at bat ratio (62 K’s in 514 AB’s). He also is a very solid defender who seems to be im proving with time. Most importantly to me, he is just about to enter the prime years of his career (he just turned 26 at the beginning of this month). I see him being an all-star in the next 2 to 3 years. He will never be a superstar- but he will be a highly productive player nonetheless. If the Braves trade him off, I just do not see how they can replace him. There are simply no good free agent shortstops this offseason. All but one are over 30 years of age. The biggest “names” outside of Furcal are Omar Vizquel, Edgar Renteria, and Nomar Garciaparra- clearly guys on the downsides of their careers (if not already at the end). Separately, Brent Lillibridge is the best positioned “prospect” to replace him from the Braves’ farm system, but that would be a step backwards. Lillibridge may be a solid player in terms of fundamentals, but I don’t envision him being more than a bench-player and spot starter long-term. (Plus, he looks like a 14 year-old kid- who wants that near the top of their lineup: the Braves need respect, not ridicule). The Braves need a blockbuster move or free-agent signing this offseason. But they should not make the mistake of sacrificing the future for today. 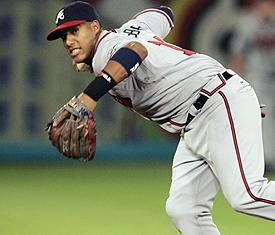 Yunel Escobar should be considered a fundamental part of the Braves future, alongside Brian McCann and Jair Jurrjens. BRAVES: Don’t Gamble On A.J. Burnett! SEC CHAMPIONSHIP: Why Alabama Will ROLL ALL OVER Florida!